Am I obliged to register at the Foreign Police? If you are planning to stay in the Czech Republic for more than 30 days, you must register your place of residence in this country within 30 days after arrival. It is possible your landlord has done it for you: accommodation providers have to register their guests with the foreign police if they provide accommodation to 5 or more foreigners. Most hotels, hostels, dormitories carry out this duty. You can check with the Foreign police if you have been registered and get a stamp in your passport. Registering with the Foreign Police is easy. You can just visit the office and fill in a short form. Bring just your passport or ID card and make sure you know your exact address, the name of the property owner and the day of your arrival in the country. In exchange for the form, you will get a stamp in your passport with the address filled in or an extra sheet in case you came with your ID only. The officers don’t usually speak English. The process is easy enough to manage without speaking Czech, though. What if I later change my address? Or name or passport number? Any subsequent changes (of address, family status, name, passport number) do not need to be reported to the Foreign police. However, if you hold the Certificate of temporary residence issued by the Immigration office, you have to report the changes – read how to do that in a different guide. If you intend to stay in the country for more than three months, you have the right to apply for a residence card: The certificate of temporary residence (“potvrzení o přechodném pobytu”) should be requested through the regional office of the Ministry of the Interior – the Immigration office, located at Hněvkovského 65. Though possession of the certificate is not obligatory, you will find that the card along with the national birth number (“rodné číslo“, a sort of a social security number) may well simplify your life in the future. 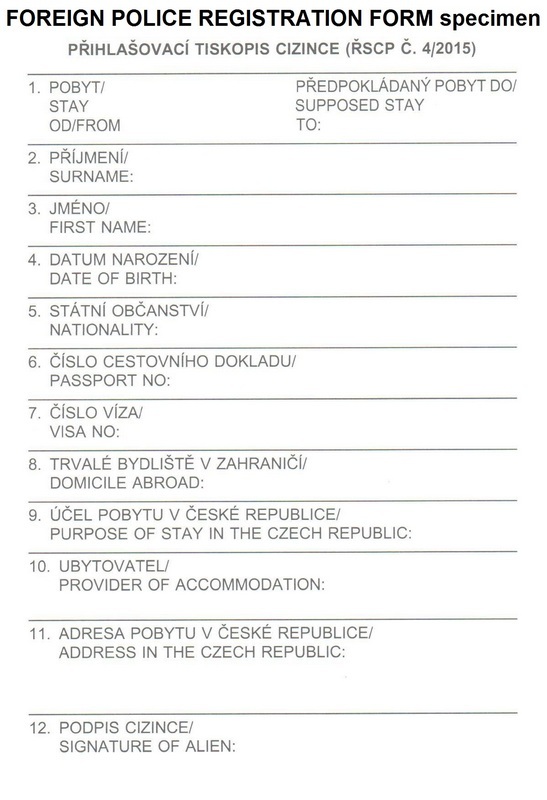 For example, for things such as obtaining a mortgage or registering your car you will require this certificate, or if you should wish to take out permanent residence in the Czech Republic down the line sometime, the certificate will provide proof of the length of your stay in this country. Click here to read a separate guide about obtaining your temporary residence card. You are obliged to register your place of residence with the Foreign Police or the Immigration office within 3 working days of your arrival in the country. This applies for visa holders as well as for visitors with no visa requirement. Any subsequent change must be reported to the Immigration office (Hněvkovského 65) within 3 days, in case of name, marital status and passport number; or 30 days in case of change of address. Read our guide for Residence permits to find out more. The Foreign Police are in charge of everything regarding a short-term Visa up to 90 days. Anything longer has to be sorted through the Immigration office. For long term residence permits (following the visa) contact the Immigration office of the Ministry of the Interior (located at Hněvkovského 65). Arranging an appointment beforehand may save you a couple of hours of waiting time – use the server Foreign Registration System to arrange a meeting. All visas to enter the country have to be applied for at a Czech embassy abroad. Visa requirements are listed at the Ministry of Foreign Affairs web site. More information about the residence permits can be found directly at the Immigration’s office website: immigrationportal.cz. Shortly after your arrival to Brno, you should head over to the Immigration office or Foreign Police and register your place of accommodation.